Thanks to Okemo Mountain Resort’s experienced snowmaking and grooming teams and more than seven feet of natural snowfall this season, Okemo’s massive superpipe is ready for wall turns and catching some air. Measuring 500 feet in length with 18-foot high walls, the Okemo Superpipe presented by Schweppes is now open daily. The Okemo Superpipe is located in The Zone and features its own surface lift, The Pull, which typically operates on weekends and during peak periods. “We have a surface lift that runs between the park and the Superpipe, so you don’t have to ski down and ride a chairlift. You can keep running laps on the T-Bar and riding one of two terrain parks or the Superpipe,” Okemo’s Bonnie MacPherson told SnoCountry.com. 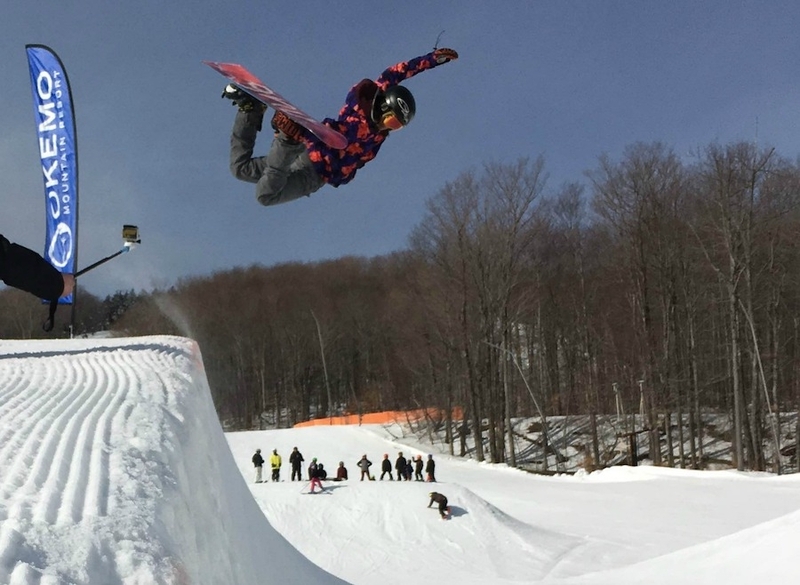 In addition to the Superpipe, the resort has also constructed seven terrain parks containing more than 50 jumps, rails, boxes and other creative features. Okemo’s Parks Crew has been working with Snow Park Technologies to design and build its terrain park features. MacPherson told us the subterranean pipe is built into the ground, meaning it takes less snow to create. Construction of the Okemo Superpipe required 51 acre-feet of snow, approximately 12 hours of excavator time, and 145 hours of operators working in snowcats to complete the project. Okemo’s former VP of Operations, Barry Tucker, put Yankee ingenuity to work, MacPherson told us, in looking to find a way to lose less snow when the pipe cutter came through to clean up the lines. Using the same laser technology that surveyors use, the team designed a system that provides laser-precision when cutting the pipe. “It’s always interesting to see the amount of innovation that goes into running a ski resort,” MacPherson added. The resort is scheduled to host a variety of events and competitions in the weeks ahead.